"How Do We Properly Receive Our Lord in Holy Communion?" "How Do We Properly Receive Our Lord in Holy Communion?" It is crucial for every Catholic to know that our Lord Jesus Christ is truly, really, and substantially present in the Eucharist. Therefore, it is important for Catholics to know how to properly prepare to receive our Lord in Holy Communion. First, let us begin with a person’s spiritual state. The Catechism of the Catholic Church states in paragraph 1385: “To respond to this invitation, we must prepare ourselves for so great and so holy a moment. St. Paul urges us to examine our conscience: ‘Whoever, therefore, eats the bread or drinks the cup of the Lord in an unworthy manner will be guilty of profaning the Body and Blood of the Lord. Let a man examine himself, and so eat of the bread and drink of the cup. For anyone who eats and drinks without discerning the Body eats and drinks judgment upon himself.’” Anyone conscious of a grave sin must receive the sacrament of Reconciliation before coming to communion. Let us now consider appropriate ways to physically receive our Lord. 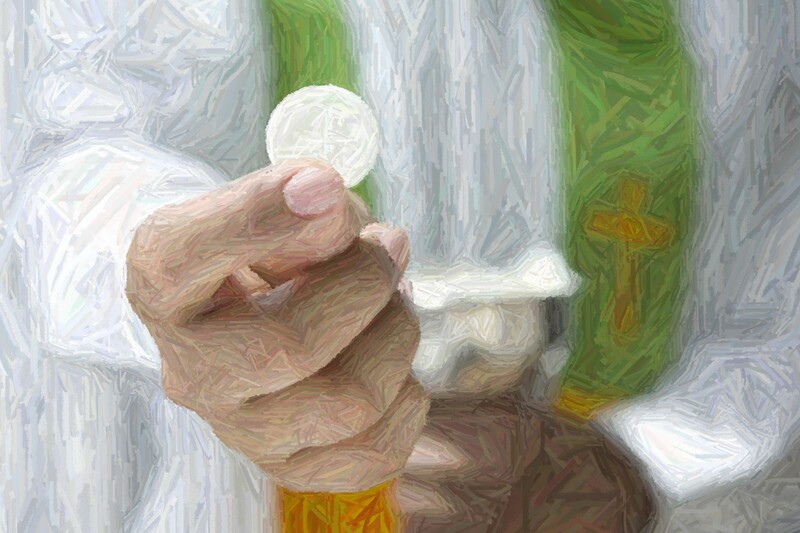 The U.S. Bishops determined that the faithful should bow before receiving Holy Communion as an act of reverence—preferably at the time the person immediately in front is receiving. The norm in the United States is that Holy Communion is to be received standing. However, if an individual person wishes to receive Communion while kneeling, it is perfectly licit for them to do so, and the priest should not hinder them unless there is good reason. The Congregation for Divine Worship and the Discipline of the Sacraments states: “Hence, any baptized Catholic who is not prevented by law must be admitted to Holy Communion. Therefore, it is not licit to deny Holy Communion to any of Christ’s faithful solely on the grounds, for example, that the person wishes to receive the Eucharist kneeling or standing.